Shiraz by Fowles of Strathbogie. The palate is elegantly structured and brilliantly balanced, layers of ripe plum, chocolate and spice, over a length of meaty, velvet tannins, supported by the juicy turkish delights of Viognier and lightly fragrant, tobacco carob oak. The Fowles family have been at the centre of Victoria's commerce and development since early settlement. Fowles Wine own and operate a substantial acreage of vines in the Strathbogie Ranges, their two splendid estate vineyards, Billi and Upton Run, are source of the most decorated wines in the land. The Fowles brand have continued to deliver with the most celebrated editions and memorable vintages, drawing fruit from the pick of their Strathbogie vineyards to be aged in the luxury of completely new oak, the first choice for service alongside flavourful game recipes, suckling pork or lamb. The Fowles family remain very much at home amongst the rugged Strathbogie Ranges, their wineworks were established astride a striking granite massif that rises to over five hundred metres above sea level. They are surrounded by a multitude of dramatic granite outcrops that burst from the surface of these ancient highlands. The region provide great conditions in which to grow fruit: In the coolness of spring the vines produce only small berries and the ensuing low rainfall and the intense summer sun gives rise to a fruit that is dense in colour and flavour. Energetic and enterprising, they continue to break new ground by bringing the Strathbogie Ranges message in a bottle to the world. Perched on a hill at the edge of the Strathbogie Ranges, the stunning new winery with its arching steel roof is a local landmark visible from miles afar. 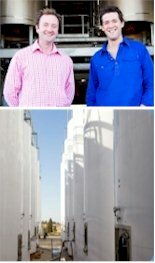 The Fowles bring a wealth of experience and skill in the arts of the winemaking industry. This sizable venture is the result of mergers between Victoria's most accomplished brands. Their operation incorporates the latest technology winemaking, bottling line, cellar door, restaurant and corporate headquarters. The exceptional reputation of Fowles Wines are built on a solid foundation of experience, knowledge and capability and the ambition to lead the charge in the next exciting wave of the Australian wine industry. The showcase winery began operations in 2000, Fowles acquired Dominion Wines and added many of the most prestigious labels to their portfolio, Stonedwellers, Upton Run and Blackwood Ridge. The venture has got away to a dream start. The operation's imposing fermenters have the capacity to store 2.5 million litres of wine. The wineworks feature a vast barrel hall with 1000 barrels and an enormous loading bay. The winery is the crucible five main wine brands and also produces wine for many client brands. There are several fulltime, highly trained winemakers on site, rather more than is usual for a winery of its size, enabling thorough attention and skill to be paid to each batch of wine. There's also a state of the art laboratory for wine and grape analysis. At the height of vintage, the harvest season usually from March until May, the winery operates twenty four hours a day with twenty staff. The site has the capacity to crush 7500 tonnes of fruit each vintage. There are three tank presses and a whole bunch grape press for sparkling wine. Further along the production line there are sixteen impressive sweep arm fermenters and a wide array of filtration systems, including the latest crossflow filters. The new Italian built bottling line deftly handles bottle rinsing, capable of both cork and screwcap stelvin, while its labeller has three heads, giving it the ability to apply three different labels to one bottle. The bottling line can produce up to 2000 cases of wine, 24,000 bottles per day. The winery also has its own environmentally sound wastewater treatment plant. Once restored to health, the saved water is put to good use in the spacious gardens and plantations of trees around the facility. On the estate surrounded by vines, the Restaurant and Cellar Door is an idyllic spot to break up a journey on the road north from Melbourne to Sydney and the snowfields, or to begin a tour of the surrounding wineries. Chef Melissa Rigg and her team guarantee superb coffee, prompt service, fresh, tasty snacks and wonderful lunches. The spacious main room overlooks the gardens and vineyard across the scenic Hughes Creek valley to rugged Mt Bernard. The Provence-style courtyard has outdoor tables, broad umbrellas and modern playground equipment where the kids can play in safety.